Buttons from the skin. From old leather bags, the tops of old boots it is possible to make the buttons to the dress or jacket (Fig.226). For the manufacture of buttons cut small detail trapezoidal shape, smeared with glue and the inner side of the fold starting from the wider side. Rolled leather button closure wrap strong thread in the middle, tight tightening. The button sew on foot, grasping a needle, a layer of thread windings. The ends of the buttons are rounded, cutting corners. The size of the buttons depends on the range. Triangles. Pleats on skirts are sometimes fixed by gladium triangle - "nun" (Fig.228). "Nun" is also used as a decoration and when attaching the pockets and sections. If the material is soft, put a piece of fabric and embroider gladely triangle suitable color thread, wool or silk. Triangle can be done in different ways. 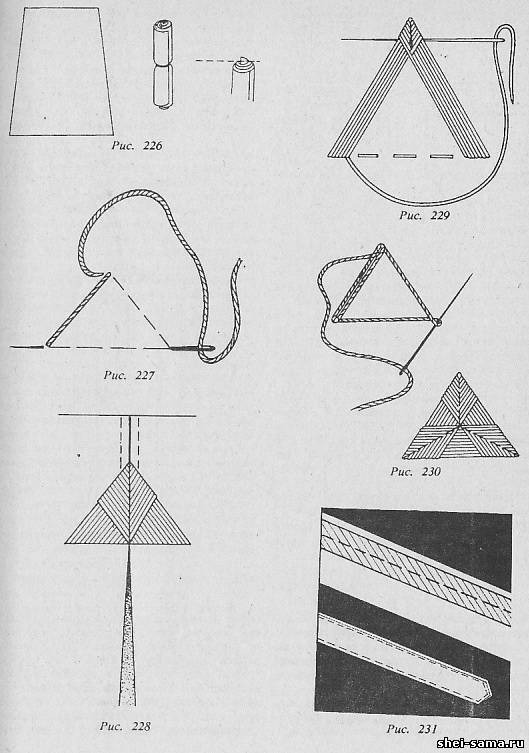 The figures shown 227-230 different ways to do triangles. Manufacturer of belts. The most common can be considered a narrow belt made of dress fabric, artificial or genuine leather, suede and other materials. The belt was hard, he put a lining of crinoline, crisp linen, faux leather and even of paper, in that case, if the belt don't expect to wash. Good for this purpose to use the adhesive strip in two layers for greater rigidity. For the manufacture of a belt of fabric cut a strip equal to twice the width of the belt with the addition to the seams (1 cm). The gasket should be equal to the belt. The strip is encircled by the stiffener so that the invoice has passed the seam 1 cm from the edge of the belt (Fig.231). The right end of the belt is usually done with an acute angle on the left to leave temporarily open. Cream the iron belt and then across the face of the lay line at a distance of 3 mm from the edge, simultaneously grabbing the seam strike. For the manufacture of the buckle piece of wire bent as shown in figure 232.Then pre-prepared rulik from fabric stretched on a wire form buckle and its ends are sewn by hand. On the thus obtained the buckle is fixed a peg (Fig.233) which can be drawn from the headpin. On the left end of the belt at a distance of 4 cm from the edge, make a puncture with an awl and insert the peg buckle. Belt edge bend and hem to wrong side by hand or machine. To belt you can fasten tighter or looser, it make some serged holes and insert the eyelets (Fig.234). How to fit a buckle. Buckle need not only to fasten the belt - they decorate it. Buckles come in different shapes and colors. If you want the buckle is not allocated, its tight material. 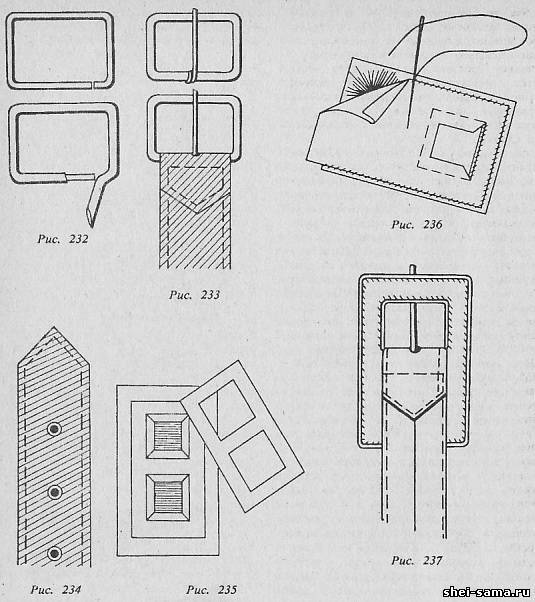 Figure 235 shows the most common method of wrapping the buckle. The material cut out the shape of the buckle, making the seam allowance. In the middle of the fabric cut. The outer corners of the fabric cut, and in the products of fat tissue are cut quite. Buckle envelop the fabric and the edge of the fabric sew. Stitches close braid or lining (Fig.23B). After the verification of the width of the buckle width of belt it attached to its left end.So buckle sat denser, belt sew another crossbar (Fig.237).